In terms of its style, its heraldry, and details of its text, this volume is a member of a close-knit group of manuscripts made for members of the Bohun family, who were earls of Hereford, Essex, and Northampton for most of the 13th and 14th centuries. It is possible that it was made at the Bohun family castle at Pleshey, a few miles north-west of Chelmsford; John de Teye (probably from Great or Little Tay, a few miles west of Colchester) is recorded as having worked as the family's illuminator there. The initial contains four scenes: the arrival of the Holy Family at Jerusalem for the Presentation; the Presentation; the arrival of the Holy Family at Jerusalem for Passover; Christ among the doctors (Luke 1:22, 2:42, 46). To the left and in the borders are a pope, two half-figures of Christ in the tomb, and two angels holding Instruments of the Passion. 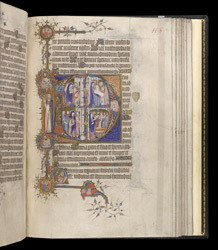 The smaller initial shows John the Baptist addressing a crowd.